Back in 2000, astronomers discovered their first space blob billions of light-years away from Earth. It was glowing as brightly as a galaxy, and was as big as one, yet it didn't seem to be made of stars — only loose hydrogen gas. Scientists kept finding more space blobs, eventually finding about 30 , but no one could clearly explain why they shined so brightly. However, astronomers now think they've finally cracked the case of these big cosmic mysteries, according a release issued by the European Southern Observatory . The blobs are technically called Lyman-alpha blobs (LABs) and they shine brilliantly in ultraviolet, a "color" of light that is invisible to human eyes yet advanced telescopes can detect. 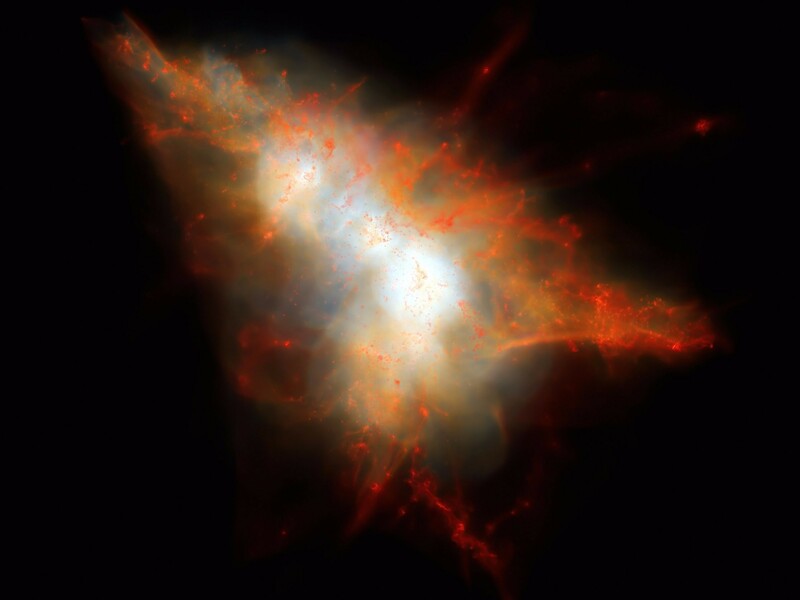 The first and best-studied blob, called LAB-1, is about 400,000 light-years across. And it's actually a relatively "young" object in our 13.8 billion-year-old universe — it's so distant at 11.5 billion light-years away that observing it is like traveling back in time, to when the universe was about 2.3 billion years old (thanks to the finite speed of light ). By combining the views of many different telescopes, plus some advanced computer simulations, dozens of astronomers in a new Astrophysical Journal study report the source of the blobs' shiny glow: A chaos of star formation that's happening 100 times faster than in our own galaxy, the Milky Way. First, the team used the Hubble Space Telescope, the W. M. Keck Observatory in Hawaii, the Very Large Telescope in Chile, and the Atacama Large Millimeter/Submillimeter Array (ALMA), also in Chile, to observe LAB-1. Those images not only revealed the flurry of fresh stars deep inside the hydrogen cloud, but also small, nearby galaxies pouring star-forming materials into the mix. A computer simulation used that telescope data to reveal why LAB-1 was so shiny. As new stars embedded inside the blob are born, they burst out intense ultraviolet light — which then scatters off the hydrogen gas and illuminates it into a glow. "Think of a streetlight on a foggy night — you see the diffuse glow because light is scattering off the tiny water droplets," Jim Geach , the study's leader and an astronomer at the University of Hertfordshire, said in the release. "A similar thing is happening here, except the streetlight is an intensely star-forming galaxy and the fog is a huge cloud of intergalactic gas. The galaxies are illuminating their surroundings." And by solving that mystery, Geach and others were able to close the case on another: where and how the most massive galaxies in the universe are born. "Lyman-alpha Blob-1 is the site of formation of a massive elliptical galaxy that will one day be the heart of a giant cluster," Geach said in the release. "We are seeing a snapshot of the assembly of that galaxy 11.5 billion years ago."